Two Totsumen in the level 40 Below Fridge. One is preparing to charge at Wario, who is holding a second Totsumen. 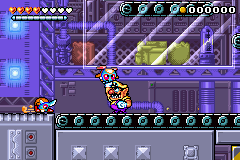 Totsumen (トツメン, meaning "clash face"), are enemies found in the game Wario Land 4. Totsumen have a red body and wear a mask with a knife protruding out from the top. A Totsumen attacks by pointing his knife at Wario once he catches sight of him, and will charge a few seconds later. Wario will take damage if he is to touch the sharp point of the enemy. He is able to defeat them by ramming the side while Totsumen is standing upright, or when a Totsumen prepares to charge, Wario is able to ground pound the head to defeat it. Totsumen behave exactly the same way as Eggplant Warriors, which are purple foes who assist the boss Spoiled Rotten. This page was last edited on October 8, 2018, at 14:55.